Most know that my Mom is from out of town. She still lives in the Province of Quebec, and I do get to visit there from time to time, but with the two newest littles, that hasn't been as easy for me in the last few years. So she's been the one coming down a few times a year to spend time with our little family. Luckily, we are both tekkie enough to know how to operate Facetime and Skype, and we still get to see each other almost daily. Isn't technology wonderful? Here we are, a good 7 hour drive away from each other, but she still gets to see her grand kids growing, which we both love so much. It's amazing how used to it the kids get to it too, and so funny seeing the littlests' reactions whenever she decides to visit. It's total confusion, like, wait, this is Nana from the screen, how'd she get out of the screen? LOL! Anyway, here are a few shots from her visit last October, just before Halloween. It's always nice having her around during holidays of birthdays, as it makes them feel that much more special. 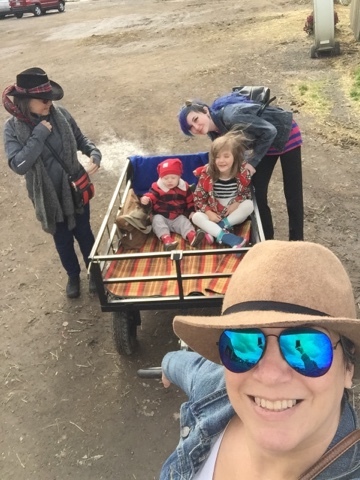 On this visit, we did our usual errands all over town, especially to places we can't always readily get to, because we don't have a vehicle, and traveling with 3 kids - even though one is a teen, the other two are still in car seats, or in a stroller - isn't always easy. 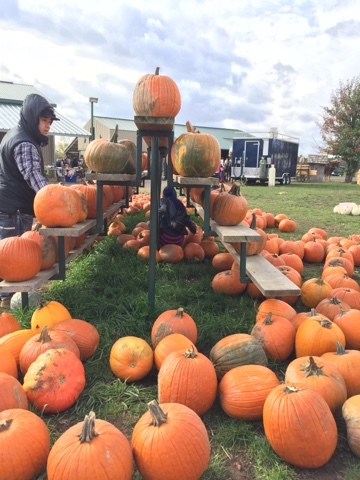 But this time, we did something special, we brought ALL the kids to a local pumpkin patch, and it was fun, until the wind picked up, and everyone started whining about the cold. Heh, October is funny that way. Fall has such a way with colours. I love how the leaves start changing, and morning dew has a tendency to frost. It always makes for such interesting photo opportunities. 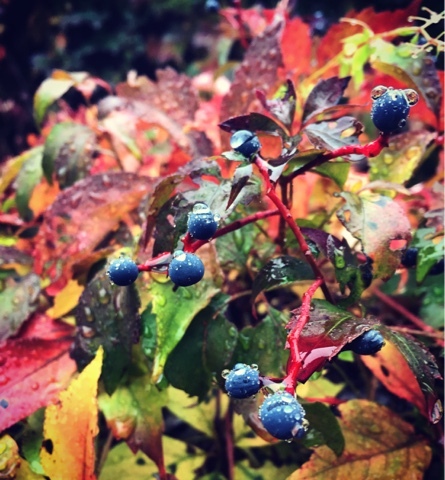 I'm not sure what this plant is, but it's a type of vine, and the berries almost looked like grapes, but don't quite grow the same way. I thought they were perhaps elderberry? Mom and I have a bit of a tradition when she visits. Whenever possible, she likes to keep it a secret, so that at the end of the school day, she can surprise the kids by picking them up at school (I'm with her, of course, as since Mom doesn't live here, she's not on the approved pick up list). But on this day, it truly was a surprise for Didi to unexpectedly have her Nana pick her up. It would be difficult for the teachers to NOT know who she is, what with Didi running up to her yelling "NANA! NANA! NANA!" Ha! Ha! 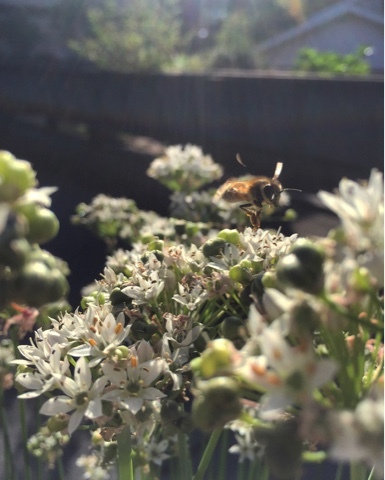 It was so balmy and sunny that day, that the little bees were still busy collecting pollen from the fall flowers. Here is one thoroughly inspecting our garlic chives, which I really hope will make a comeback this Spring, since I love using them in so many dishes. 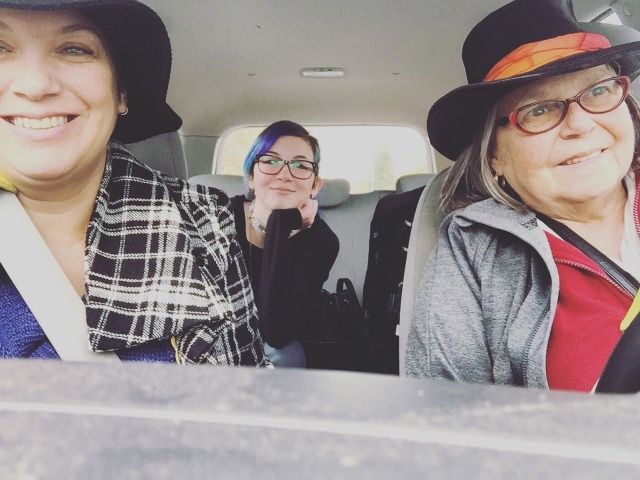 The boy stayed home with Daddy one day, and it was just us girls all piled into Nana's car, and we headed to our local Outlet Mall, which we commemorated with a carfie, of course. 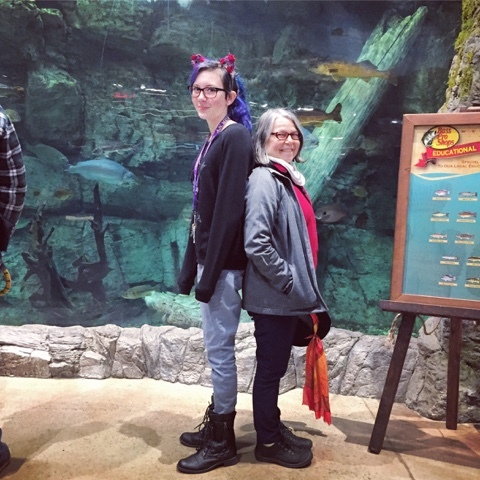 Always a fun place to go for some fun shopping, and of course, stopping at the HUMONGOUS Bass Pro Shop there - between my Mom and Darling, we never seem to be able to avoid that place ;) It's always interesting though, there's no shortage of different ourdoorsy stuff to see. The littles are particularly fond of the huge aquarium of indigenous fish at the back. The tank is so big, and I believe they try to mimic the fish' natural habitat as best they can (if wild fish had a huge glass screen on one side where humans could just gawk at them...). Good thing I always bring a stroller when we head out. 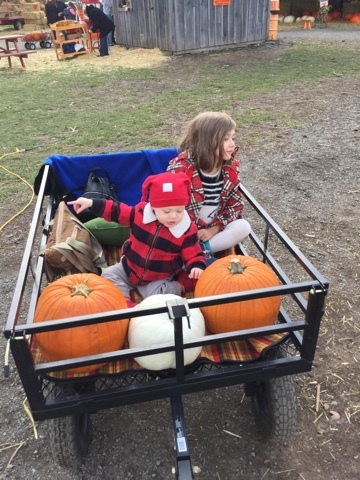 It was such a perfect setup, Mom had some awesome picnic blankets in her trunk, which we used to pad the bottom of the cart, and create some padding at the back for the kids to lean up against. 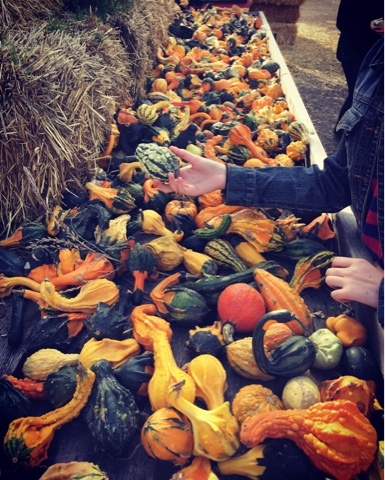 I don't know about you, but I just love these awesome little gourds. They come in such a variety of shapes and sizes. If I'm not mistaken, I do believe I retrieved some seeds from these, to try and grow some for ourselves this year. Which reminds me, we really should get on top of starting some seeds for our garden soon. With our son being a bit bigger, I think gardening will be a little easier for me this year. And watching littles play in the garden and teaching them about growing your own food is always so much fun. 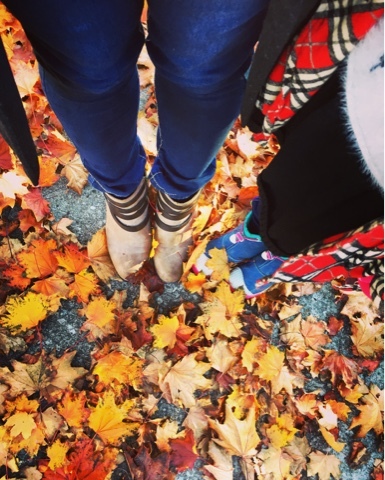 On Nana's last day, we got to kick some pretty, colourful leaves all the way to school. It's always sad to say goodbye to Nana, but, we always know she'll be back in just a few months. 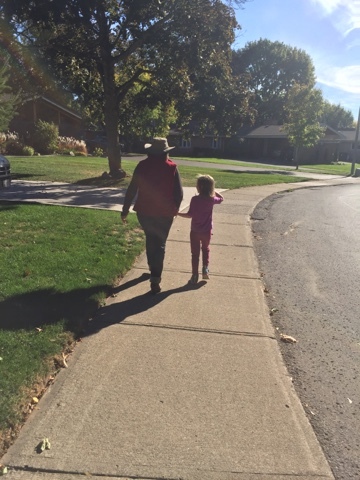 Which, as of today, is in just weeks, as she's decided that this year, Mother's Day was going to be an extra special celebration for us, and that we will be spending it together. Can't wait to see you in May Mama!